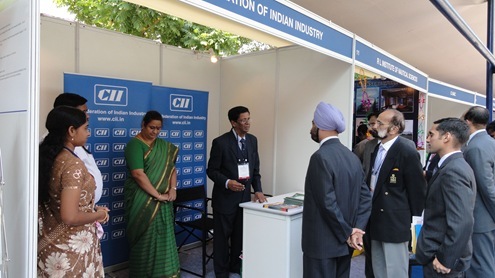 Confederation of Indian Industry (CII) and National Maritime Foundation (NMF) have jointly hosted India Maritime Technology Conference (IMTC) 2011 on January 21 & 22 at the National Institute of Ocean Technology (NIOT), Chennai. An appropriate theme “Sharpening India’s Sea Vision” to coincide with the Maritime Agenda 2010 – 2020 released by the Union Minister of Shipping, Mr G K Vasan on January 13, 2011. 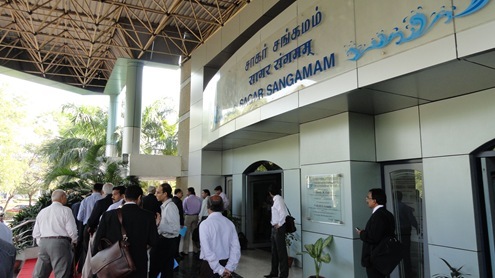 AMET University, Chennai as the Knowledge Partner for the conference. 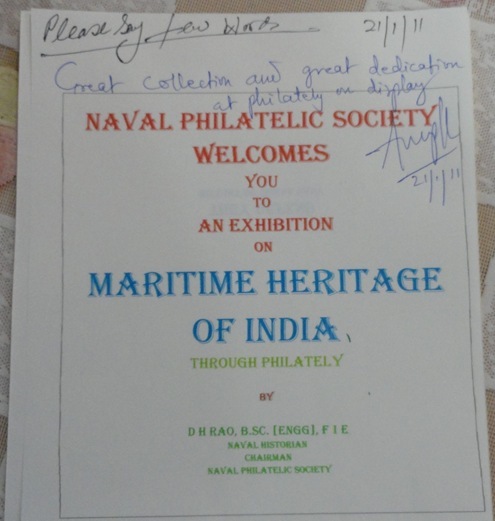 An excellent exhibition on Maritime Heritage of India through Philately by D H Rao, Naval Historian, Chairman, Naval Philatelic Society. 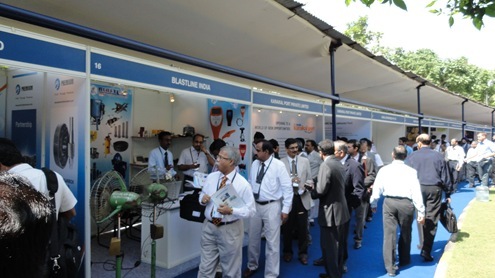 Stalls put up by prominent maritime agencies to display their latest products. Opening Address by Mr T T Ashok – Dy Chairman, CII Southern Region & Managing Director Taylor Rubber Pvt Ltd.
Theme Address by Admiral (Retd) Arun Prakash – Chairman, NMF & former Chief of Naval Staff. Keynote Address by Dr T S Sridhar, IAS – Principal Secretary & Commissioner of Archaeology, Govt of Tamil Nadu. Address by the Chief Guest – Vice Admiral Anup Singh – Flag Officer Commanding in Chief, Eastern Naval Command. Vote of Thanks by Commodore (Retd) S Shekhar, IN – Regional Director, NMF. Followed by opening of stalls put up by prominent maritime agencies. Development always takes place faster only in coastal areas. with 7500 plus kilometer long coastline has less shipyards. with billion plus people has less seafarers. We are not good at writing our own history. Submarine INS Vela, decommissioned last year is expected to be brought to Chennai and converted as a museum for display. 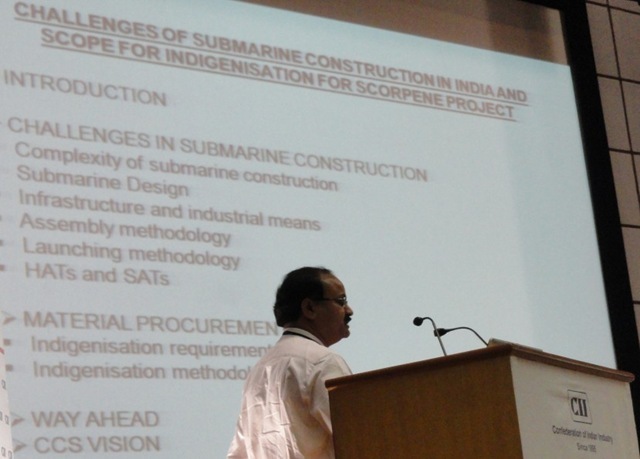 Challenges of Submarine Construction in India and Scope of Indigenization for Scorpene Project – by Mr Mahesh B Koyande, DGM & HOD Design, Mazagon Dock Ltd, Mumbai. Ship Repairs in India – Opportunities and Challenges – by Mr S Krishnakumar, Head Repair & Refit, L & T Ship Building Ltd, Kattupalli, Chennai. Warship Construction in Indian Defence Shipyards, the Present and Future – by Capt (Retd) SKS Kushwaha IN, GM (Production), Garden Reach Shipbuilders & Engineers Ltd, Kolkatta. How Can India increase its Market Share of the New Building Orders ? – by Mr Hrishikesh Narasimhan, GM Ship Building, Goodearth Shipbuilding Pvt Ltd, Chennai. Shortage of Naval Architects and specialised CAD personnel. Stealth technology no more limited to submarines alone. Series production of warships (minimum 6 to 10 no) must be done to minimize cost and reduced delivery time (present practice is to build 3 or 4 ships). Modernization/up-gradation of shipyard facilities and processes including human resources. While procuring submarines from other countries, complete technology including submarine design must be taken from the supplier. Setting up of parallel infrastructure for submarine construction in defence shipyards as submarine construction is totally different from surface warship construction. Increase creation of trained pool of workers. National policy on submarine construction must be known to Indian industries to encourage participation in construction. development of equipment to comply with acoustic requirements and resistance to shock requirements of submarines. non HLES steel such as S355 steel. To cut down time and cost over-run in ship building and ship repair, marine engineers involved in these activities have to fully involve in site work instead of giving elaborate justifications/excuses for the delay through computer excel sheets. Freeze all shipyard processes and have a clear documented ‘build strategy’. Translate it into a yard layout. Standardize shipyard’s product by standardizing quality of material, processes, equipment, safety and competency of personnel. Design and Development of Combat Management Systems – by Rear Admiral Arun Bahl, DG – Weapon Electronics Systems Engineering Establishment (WESEE), New Delhi. Opportunities for the Indian Industries in the Maritime Preparedness of the Nation – by Rear Admiral S Kulshreshtha, DG – Naval Armament Inspection, New Delhi. Marine System Integration – by Capt Siddhartha Sant, Director Marine Engineering, Indian Navy. Get away with L1 methodology (consider expertise also) in selecting vendors, subcontractors. Architecture frameworks: Unified profile for DoDAF & MoDAF (UPDM); ToGAF. System Engineering: Real Time Embedded Systems (RTES). COTS Roadmap & Technology Incubation to tackle obsolescence & Enhanced User Requirements. Opportunities for Indian industry in Marine Police, Coast Guard. Maintenance of Propulsion system and Electrical Power Generation equipment. Repair and maintenance of electronic communication equipment. Supply and maintenance of night vision devices, binoculars. Development of technology/equipment for counter-terrorism. Sensors and communication equipment for border surveillance including satellite based systems. Devices to detect and neutralize Improvised Explosive Devices (IEDs). Industry must be also ready to provide spares/expertise/upgrades on 24×7 basis wherever the ship is. Industry must develop their R&D in stealth technology relating to Infrared Signature (IR), Noise and Vibration levels of equipment to minimize Air Borne Noise (ABN), Structure Borne Noise (SBN). Opening Remarks – by Mr Umesh C Grover, Senior Advisor (Shipping & Logistics), SKIL Infrastructure Ltd, Mumbai. Developments of Ports & Harbours – by Capt Suresh N Amirapu, MD, Portman India Private Ltd. Significance of New Gateway Ports – by Capt K N Ramesh, CEO, Logistics & Dredging, Marg Limited. Exclusive DG – Ports has to be set up to ensure faster development of Ports & Harbours. Single window system for procedures and approvals. Industry not to be trapped in State vs Central govt interests. Minor ports (except Gujarat) are not doing well. Plenary Session IV (Panel Discussion): Offshore Energy – How Soon in India ? Moderator – Dr L R Chary, Prof Emeritus, AMET University, Chennai. Presentation on Futuristic Design of Offshore Wind Mills – by Prof KNG Reddy, AMET University, Chennai. Panel Discussion – by Mr Rajesh Katyal, Scientist and Unit Chief (R&D), Centre for Wind Energy Technology, Chennai. Panel Discussion – by Mr Nitin Bhate, Policy & Marketing Manager, GE Renewables (India). Panel Discussion – by Mr Malolan R Cadambi, MD, Greenshore Energy Pvt Ltd. The government (for that matter even god) can not increase the price of wind (unlike petrol, diesel, lpg prices). Through innovative technology, cost of offshore wind power can be controlled/minimized. Environment is not affected by offshore wind farms (in fact it boosts the marine life). Maintaining offshore wind mills is easier than maintaining offshore oil platforms. NMF must take the initiative to develop this industry faster in India. Human Resource (HR) Challenges in Design & Development – by Dr K Tamilmani, CEO, CEMILAC, Bangalore. Emerging R&D Opportunities for Marine Industries – by Dr S Sundarrajan, Scientist ‘H’, DRDO L, Hyderabad. 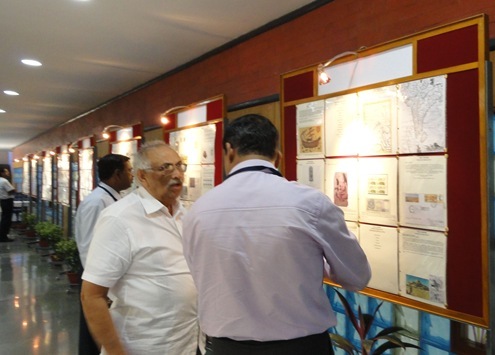 Maritime Research in India – Opportunities and Challenges: by Prof (Dr) Rao Tatavarti, Director and Senior Professor, Gayatri Vidya Parishad College of Engineering. Encourage private industry to take up maintenance of warships instead of burdening defence shipyards. Private industry must understand the intricacies of marine equipments and develop HR accordingly. Set up regulatory mechanism to monitor R&D. considering the fact that the cost of warship hull is only 10% of the total cost of the ship with equipment. considering the life cycle of warships: life cycle of Aircraft carrier/LPD/Tanker is as high as 45 years plus. in areas of material, processes, corrosion, indigenization, high capacity fuel cells. to ensure high performance, less maintenance, high energy efficiency, environment friendly and sustainable systems in ships. Set up Integrated Marine R&D by involving shipyards, industry, academic institutions. Do not consider R&D as waste of time or money. India with high man power (18% of world’s population) stands low in Science & Technology as India spends 1% of GDP for developing Science & Technology. Betterment of Maritime Security and Infrastructure – by Mr R Sri Kumar, IPS (Retd), Vigilance Commissioner, Govt of India. Coastal Security Aspects – Tamil Nadu: by Rajesh Das, IPS, IG, Head – Tamil Nadu Coastal Security Group, Chennai. Coastal Security for better effectiveness – by Capt S Suresh, CSO to Naval Officer in Charge, Naval Base, Kochi. Develop human intelligence and integrate with technical intelligence. Encourage citizens to act as policemen without uniforms (fishermen for coast) and empower them to report freely to the authorities on what they see/hear in security related issues (use of mobile phones to a toll free number). Coastal security includes water security (as more desalination plants are coming up using sea water) and energy security (as oil imports are done using sea routes). Government is well prepared by conducting regular review meetings on coastal security and by conducting security exercises as realistic as possible. Create Marine Police cadre, conduct coastal security awareness drives including use of toll free number 1093. By all participants formed into four brain storming discussion groups. Lack of awareness among youth. Lack of availability of common platform or forum to interact. Norms for classifying major/minor ports – to be reviewed. Inadequacy in feasibility reports of PPP in ports and harbours. Lack of trust between the Indian Navy and the Industry. Lack of industry friendly policies. Lack of skilled man power. System of CDC to be introduced for shipyard workers. Most of the private shipyards are un-organized. Centralized core team/organization can be set up to train marine man power to work in shipyards. Setting up of DG – Ship Building to be considered. Ship to Shore, a Global Maritime Business – by Mr Colin Clinton, Direcor, Ove Arup & Partners, Hong Kong. ONR Global and Collaboration with India on Maritime Technology – by Dr Gabriel Roy, Associate Director, Office of US Naval Research Global, HQ – Singapore. Maritime Search and Rescue – the Malaysian Experience: by Major (Retd) Murali P V Bhaskaran, RMAF, Director, Global SAR Resources SDN BHD Kuala Lumpur, Malaysia. Ove Arup & Partners have extensive experience globally in: Port Master Planning, Waterfront Development, Offshore Windfarms, Coastal Engineering, Port Operations, Hydraulic Modeling, Transport Planning, Asset Management, Rail Freight, Environmental Assessment and Design, Contract Documentation and Site Supervision. 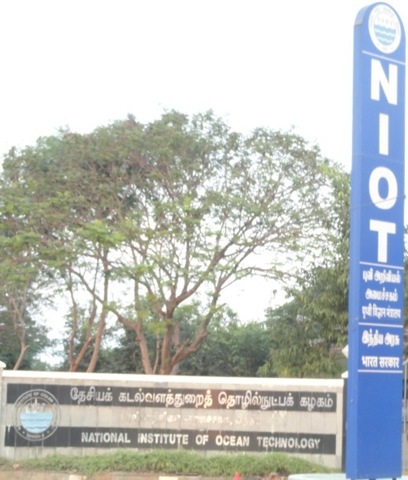 Sponsored research programs by ONR (Office of Naval Research – U.S.) in India are going on over the past three decades; ONR has also a budget of over 2 billion USD. Bilateral cooperation involving multi agencies. Create a regional fund for development of SAR. U.N. Body that addresses all SAR issues. Presentation of Draft IMTC 2011 White Paper – by Capt Suresh Bhardwaj, Vice Chancellor, AMET University. Introduction of Chief Guest for Valedictory – by Commodore (Retd) S Shekhar, IN – Regional Director, NMF. 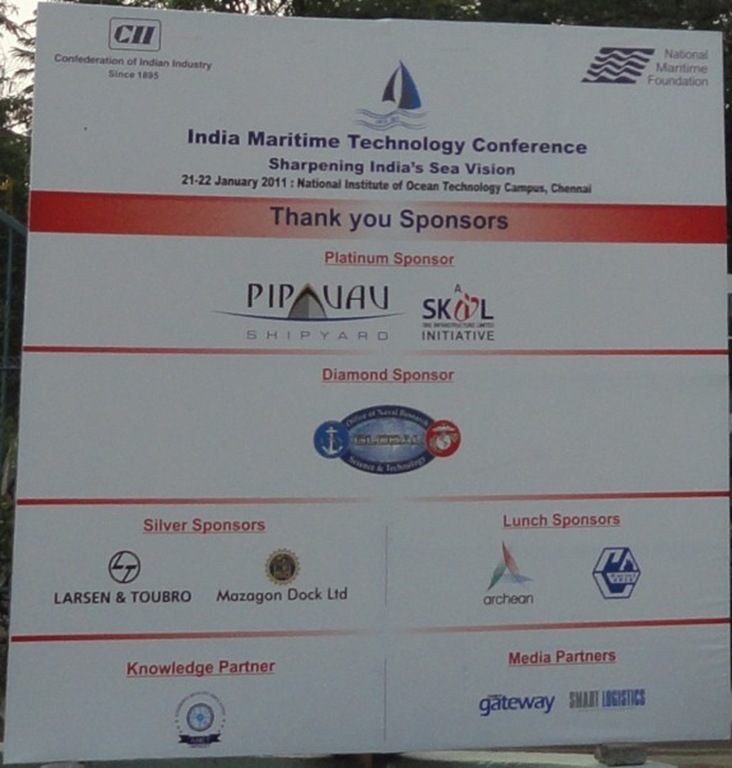 Valedictory address by Chief Guest – Rear Admiral (Retd) Rakesh Bajaj, Mazagon Dock Ltd, Mumbai. 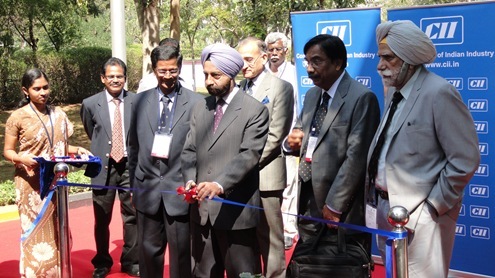 Vote of Thanks by Gp Capt (Retd) L V Mohandas, Head – IT & Internal Security, CII, Chennai. The Chief Guest emphasized that the country can prosper in R&D only when the youth specialize in Mathematics, Physics and Chemistry at graduation and post graduation levels. 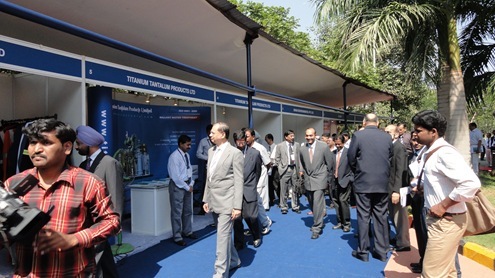 Inauguration of stalls put up by prominent maritime agencies and display of products. 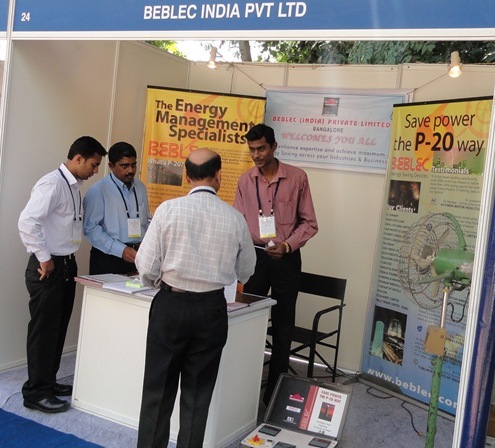 It was a great experience to attend this IMTC 2011 conference. I feel the plenary session could have included some presentation/discussions on ‘Ship recycling/Ship breaking Industry’ also.